Promotional materials to advertise meetings and the program can be found below. We provide complimentary Brochures, Posters, and Participant Welcome Flyers to all new groups that start up, however, after these run out, we kindly ask that you or your organisation please print these yourself from this page. 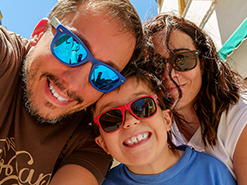 There are three different promotional formats available. 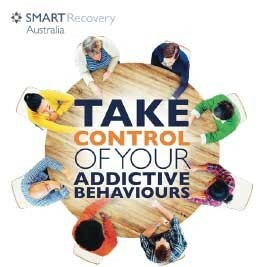 Includes basic information on the program / meetings, the organisation and telephone numbers for 24 drug & Alcohol support. 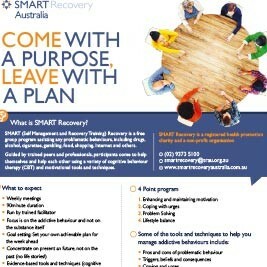 Perfect for waiting rooms and to hand to clients wanting to know more about the program. Eye-catching design with basic information about the program and where to find the nearest meeting. Designed to hang on the wall of hospital, doctor and psychologist waiting rooms, advising of the nearest SMART Recovery meeting. Includes information about the program and a more detailed description of what to expect at a meeting. Great for introducing the program to clients or new meeting participants that want to know what to expect at a meeting. 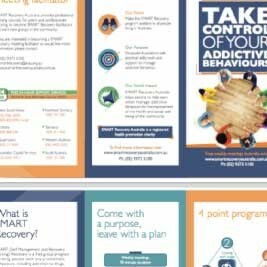 This document provides an outline of the SMART Recovery program, including some evidence and research supporting its benefits for addiction treatment. 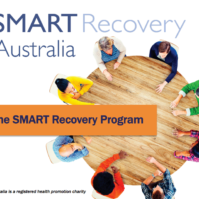 It also details our meetings, the history and reach of SMART Recovery in Australia, participant testimonials, as well as the difference between SMART and 12 Steps. Don’t have access to a printer? We understand that not everyone will have the resources to print their own materials. If you are a volunteer in the community please indicate below which promotional materials you wish to acquire and we will gladly post these out to you. Be sure to include your full postal address, as well as the meeting you wish to promote. We generally send bundles of 50 x Brochures, 10 x Posters, 10 x Participant Welcome Flyers. Unfortunately, we are unable to post single copies.